Injured, Weak or Out of Shape…Is LiveFit Right for You? What kind of things do we do? In short, anything and everything. We have never repeated the same workout twice…Never! Mostly we do bodyweight exercises including strength training, toning and endurance. We also do plyometrics, core strengthening and abdominal work. We do athletic speed and agility drills to get you quicker on your feet as well as battle ropes, resistance bands for toning the back of the arms, obstacle course days, some dumbbell exercises, lots of abs, weight training and some things that are just off the wall (you’ll have to wait to find out)!! 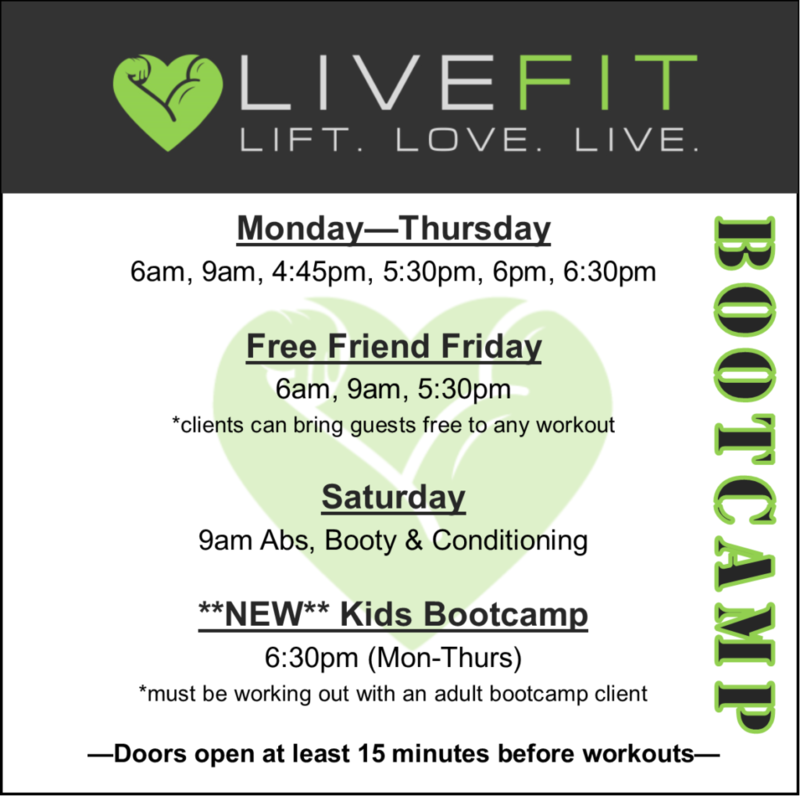 Click the picture below to see the current bootcamp schedule. My goal for every client is to see them 4 times each week, Monday- Thursday. We work the entire body over the first four days of every week so you’ll work a different muscle group and have a completely new experience every workout! When does the next Boot Camp Start? Sessions are currently forming and depending on your fitness level, most people are able to start at anytime. Due to the format of my bootcamp, people of every ability level can all work together. For beginners, I always recommend to come to our 6am, 9am, or 6pm sessions. While we do the same workout as the other groups, the pace is slightly slower with longer breaks and more personal instruction. A great attitude, a towel, a big water bottle, comfortable exercise clothing and running shoes. I provide everything you need! What is the cost (investment in YOU)? Each month of bootcamp has a registration fee that includes A MINIMUM of 16 hours of instruction with certified personal trainers! Plus with our UNLIMITED sessions format, you can take your fitness as far as you’d like with up to 52 options of Bootcamp training sessions per week! That’s under $3.70 per hour. Where else can you get fitness instruction for that incredible price? I typically charge $40 to $80 per hour for one on one personal training – this is a great opportunity to receive motivating fitness instruction by 4 of the top trainers in the Tampa Bay area for just a fraction of the cost. Click the “Get Started Today!” link below for pricing and current specials.